Located on the platinum West coast of Barbados, The Garden is the most exclusive and desirable residential area in Barbados. This is where you will find some of the most beautiful and palatial beach front villas for rent such as The Dream, Cove Spring House and Crystal Springs. The Garden has the perfect location being just a short drive north of the livelier area around Holetown and just south of the more traditional town of Speightstown. Both are very easy to reach by taxi, car or on the local bus. Just North of Holetown and as you enter The Garden area is the Folkstown Marine Park. It was officially designated a marine reserve n 1981. There is a ship wreck here which lies at 120 ft underwater and it has created an artificial reef making it a fantastic area to go for experienced divers. There is also a shallow area which is more suitable for less experienced divers and here you will be able to see a huge variety of fish and marine life. On the beach side of the park, there are tennis courts and a nice picnic area. There are however quite a few very nice restaurants and bars within the local area of The Garden should you not wish to wander far from you villa. One of the most notable of these is The Lone Star Restaurant. Recently refurbished, The Lone Star has one of the best locations of any restaurant on the island. No matter where you sit in the restaurant you will be able to hear the wonderful soothing sounds of the sea lapping against the shore. The restaurant itself is very cool and chic with a wonderful buzzy yet laid back atmosphere. 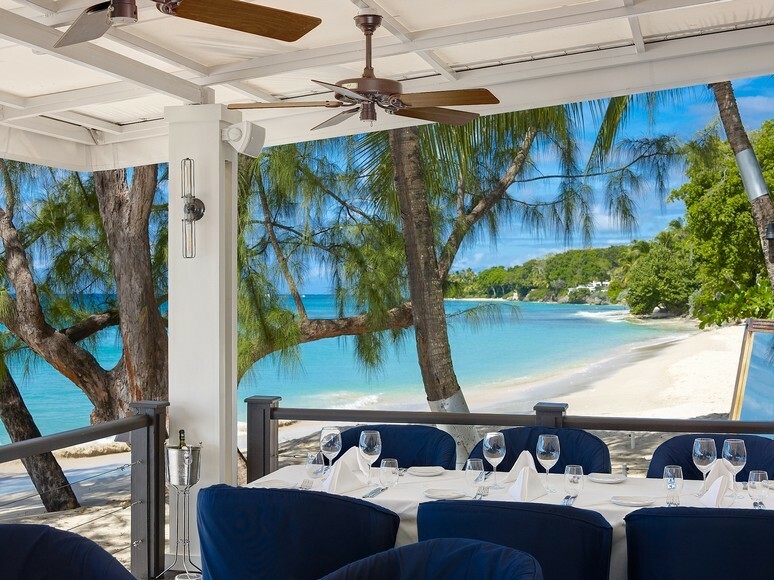 This is where you are likely to see one of the many celebrities who love to visit Barbados quietly dining in a corner. The new restaurant which also features a lovely cocktail bar ideal for sunset cocktails is a fusion of Italian and local fare. In addition one of our most beautiful villas The Lone Star Villa is located beside the Lone star. If you are looking for a more casual option then you need go no further then Ju Ju’s Restaurant and Bar. You will be able to experience some excellent grilled fish and real homemade French fries. There is also a small rum shop if you wish to have a real Barbados experience. The beach at Ju Ju’s is lovely and the sea is calm and there is a reef where you will be able to swim with Turtles at certain times of the day. Should you wish to settle in for the day, it is also possible to hire sun umbrellas and loungers. Other more casual options are Groots Bar which is very relaxed and provides a mixture between authentically Caribbean and English food and Ramshackle which is a typically Bajan Bar where you can hire sun beds and enjoy sunset cocktails. In addition a couple of the best hotels in Barbados are also located in The Garden. The Colony Club is a lovely boutique hotel with three restaurants and bars. There is also an excellent spa at the hotel should you wish to enjoy a relaxing facial or massage. The Fairmont Royal Pavilion is also a good option should you wish to dine out close to your villa. There is a very nice open air restaurant called The Palm and also a more casual option called Taboras. The Coral Reef Hotel is a more traditional Caribbean Hotel built in a colonial style. There is an excellent restaurant here where you can enjoy both European and Caribbean fare. The hotel also regularly has live entertainment during the season.